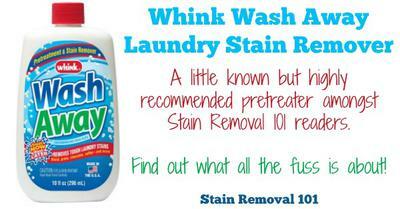 A SR101 Reader has shared her Whink Wash Away laundry stain remover review with me. 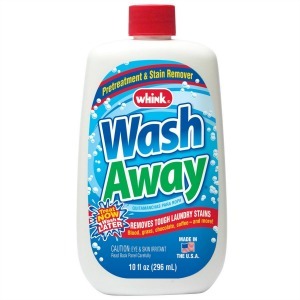 Whink makes a variety of stain remover products. I had never heard of them until a friend of mine told me that she has been using their Wash Away pretreater on her restaurant uniforms. Of course she encounters a lot of stains daily, but mostly coffee, tea, and tomato based stains. It comes in a squeeze bottle and can be applied the same day of the stain and washed later. It lists a variety of stains that it is supposed to be effective on. My friend really likes this product. All I can say is that since I have a knack of spilling coffee on myself at least once a week I tried it on a regular coffee stain (one with cream). I left it on the stain until the following night when I washed a load of clothes, and it took the stain out the first time. I would note that this product may not be something you normally see in your grocery store. In my area Meijer's carries it sporadically and it is not found in the laundry aisle, but is usually by the home goods and vacuum cleaners. My friend usually buys several bottles when she sees it. I believe it is also available in some hardware stores. I am going to be sure I have a bottle on hand from now on. Thanks so much for sharing your Whink Wash Away laundry stain remover review. You're correct that it is not often seen in stores, but it can be found online, such as through the links above. I'd love to hear from even more people who've used this, or any other laundry pretreater, sharing how it has worked for them. You can share your laundry stain remover reviews here, or read others that have already been submitted. I also work in a restaurant so I know about the stains the reader above referred to in her comments. Since the shoes I wear to work are machine washable I use Wash Away to pretreat the stains on them as well as the ones I get on my uniforms, especially coffee. My sister is the one who recommended this product as she uses it for baby formula and food stains. I was a bit skeptical until I was at her house and she showed me some of the stained clothes she had pretreated (a few days before) and was throwing in the washer, and how they looked after the wash. I no longer was hesitant in using this product. Since all of my uniforms have stains I pretreat every work day. This stuff is terrific! I really like this product for the same reasons already noted by others, and I generally do laundry only once per week. My problem is that Whink is hard to find in the neighborhood grocery stores. My daughter babysits for several people and she tends to pick up a few stains on her clothes in the process. One of her customers recommended it for pre-treating stains, especially baby formula. In fact she gave her some to take home and try. It really does work well as long as the stains are treated the same day. I wish I had known about this product sooner. If I can't locate Whink the next best product is Shout Gel for formula stains. For most garments it can be left on several days before washing. I have used the Whink Wash Away Pretreater for over a year. My neighbor used a lot of this product when her kids were small so if it were not for her telling me about it I would never have known it was available. I have succeeded in removing many stains including coffee, grass, blood, chocolate, and ketchup. It has worked on some mustard stains, but not all. Mustard is a tough stain and certain types are more stubborn than others. I always try to pretreat stains on the kids clothes the same day they happen, but even if they suddenly show up in the hamper on wash day Whink does a good job. At one time or another we all "lean" on something and not realize there is a stain on the sleeve of a shirt until it is going into the washer. Sometimes a 2nd treatment is needed, especially if they were not treated the day of the stain. This is the best pretreater for my needs. The only thing I do not understand is why this product is not found more often in the "regular" grocery stores. I work in a restaurant/bakery and serve a lot of coffee, tea, and soft drinks. Of course I always get these stains on my (light green) uniforms. Whink is a terrific pretreater for these types of stains. I typically pretreat my uniforms as soon as I return from work, then run a wash (using Wisk detergent) at the end of the week. I have tried other pretreaters when it was not available at my local store, but I always come back to Whink. My neighbor has a young son and she says it is the best pretreater for blood and grass stains, even those that may not be discovered until wash day. She also likes the fact that you can leave it on most garments up to five days. Both of us have noted that this is really a good product that most folks do not know about. When it comes to stains in the laundry I am willing to try any pretreater that can be left on the garment for several days. A friend of mine told me about this product as I never did see it among the various pretreaters in the grocery store. She said it was the only pretreater that really worked on a particular type of baby formula she used for her son. Since I knew how tough those stains could be I had to try the Whink. I have used the Whink Wash Away to remove blood, grass (on clothes and gym shoes), tomato sauce, and a variety of "mystery" stains from my son's clothes. A few minutes spent checking his clothes each day saves me a lot of time later. I have also used it on coffee and greasy food stains. There is nothing like having a product that you can apply to the stains and throw in the hamper until wash day. I would recommend this product to anyone who encounters laundry stains and does not have the time to attempt washing them right away. I first learned of this product from a coworker when I started working at a day care center. It is a great product for removing formula, fruit juice, cough syrup, and just about anything else from my uniforms. I really like the fact that I can pre-treat the stains and wash several days later. I think that how quickly you pre-treat stains and the quality of the pretreater are what allow for successful removal in the first wash.
Pretreating the stains as soon as I return home and using Wash Away does the job. Before I started using this product I used Spray N Wash Stain Stick, and while it was convenient to apply and more readily available in the grocery store, it was never as good as the Wash Away. Since it is hard to find I will purchase several bottles at a time, either at the store if I see it, or online. Thanks for sharing your experience with this product Sara, and how it works for you. Does anyone else use it as well? If so, I'd love to hear your review, which you can share with me here. I also work at a day care center. 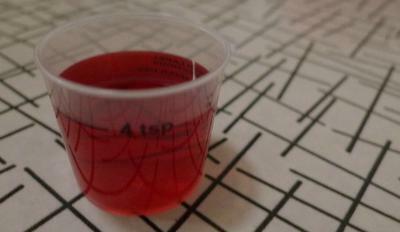 I have found Whink very effective in removing various types of medicine stains, including cough syrup from my uniforms. I always pretreat these stains the same day, but usually don't launder them until several days later. While I have used other pretreaters for many other common stains like juice and baby food, Whink works the best when it comes to medicine stains. I also work at a day care and get stains on my uniforms. I generally use Shout to pre-treat the stains daily, however for certain types of formula stains and medicine stains (vitamins and cough syrup) I count on Whink Wash Away. It is equally as easy to use and can be left on the garments for several days before washing. This product was recommended by a customer that had tried many different pre-treaters. I was using the Resolve Stain Stick pretreater for occasional stains and to pretreat shirt collars until my sister told me about Whink Wash Away. She has a lot of stains to deal with since she has a baby, and she first heard about it at the day care. I have successfully used this product on coffee, chocolate, ice cream, blood stains, and sweaty collars. My sister uses it on formula, juice, and a variety of food stains. Since I baby sit occasionally, I can vouch for its effectiveness on these stains as well, especially formula, as my past experience has been that sometimes those stains never come out completely no matter what you use. We really like the fact that it can be left on the garment for up to 5 days before washing, of course for my sister, she generally can't wait 5 days before doing laundry, but it does attack the stains and keep them from setting! I agree that it is difficult to always find Whink. My sister will usually buy several bottles at a time and share with me. If it is not available in the store, she orders 6 bottles on line. For her it is daily usage. I recently discovered Whink Wash Away when I was visiting a friend on vacation. My son had managed to spill juice on himself as well as me. My friend immediately said that she had no problem removing these types of stains, as well as others, with Whink, and considering she works in food service at a hospital, that was good enough testimony for me! She first learned about it from a nurse who said it was great for removing blood stains. I pretreated the clothes the same day, and washed them a day later. I was surprised that the stains came out totally, in one wash. I have used it successfully to remove blood, chocolate, and greasy pizza stains. I also like the concept of leaving it on the stains until I am ready to do a load of clothes. I have to admit that this product is hard to find in your normal grocery or discount stores. That is the only bad feature of Whink. I also went to the Whink website and noticed they have a special pretreater for sports, medical, and restaurant uniforms (called Uniform Wash). I have not tried it, but am curious if anyone has, and if so, how well it worked. On a separate page of the site another reader, Maureen shared her review of Oxiclean baby presoaker, and how she used it in combination with this product. That was something Barb shared she did as well. Since these two products work well together I added Barb's submission to this page so more people could learn about using them in combination. I tried several different combinations of stain removers and presoakers before I settled on Whink and Oxiclean Baby as being the best. Most of the other products I used worked fairly well on baby food and juice stains, but when it came to baby formula and the associated spit ups nothing has worked so well as Whink and the Oxi presoaker. Sometimes I use the same approach as Maureen and other times I just maintain two continuous soak buckets for light and dark clothing, so I don't use the Whink. Of course when I know I won't be able to presoak, as when we travel away from home, I pack the Whink and make sure I pretreat asap, then run the presoak and wash when I return. I also keep a spare top and some Whink in my locker at work just in case my son spits up on me before I drop him off at the Day Care, or in the event I spill coffee on myself on the drive in. And yes both of these scenarios have been a reality! I use both of these products for the stains we acquire on our clothing as well, mainly the formula spit ups. Between the Whink, Oxi Baby, and All Free & Clear Detergent everything comes out clean and no one has had any allergic reactions. My sister has a skin condition which causes her to deal with a lot of blood stains on clothing. She found Whink to be the best pretreater of all the ones she tried, and it can be left on the stains for several days before washing. Of course when she told me about it I just had to try it on stains my kids create. Some of the stains I have removed with it include blood, grass, juice, and chocolate. I also let my neighbor try it on some stubborn baby formula stains and she was impressed as well. I recommend this product to anyone who has kids, or works in a job where they get lots of stains on their clothes. I sure can relate to Sara's situation. I never had to deal so much with laundry stains until I took a part time job at a day care center. Now I deal with a variety of stains, but mostly different types of baby formula (spit ups) and fruit juice. One of our customers noticed a nasty formula stain on my slacks and said that Wash Away is her product of choice as it worked fine on her son's clothes. I immediately started using it and have never switched to any other product since it works really well. It can be left on the garment for several days before washing, which I really like. In addition to using a good pre-treater I find that a quality enzyme based detergent needs to be used as well. I use either Wisk or ERA, whichever I find the best deal on. Before I throw the clothes into the washer I pour some of the detergent on top of the stains as well. So far I have only had one instance where I needed to re wash to get out a stain, i.e. for a red beet stain. Thanks so much for your review Tonya. Since I've put up a couple of reviews about this remover I've been inundated with positive reviews of it! I'd love to hear even more, so keep 'em coming! You can share your own review here, or read reviews of lots of other brands as well. I have used this product for coffee stains and it works quite well. I recently acquired a grape flavored cough syrup stain on the back of a sweat shirt I wore when I was baby sitting. I did not realize it was there until I went to do the laundry about 5 days later so it had not been pre treated timely. I rinsed the stain, applied the Whink product, let it sit for about an hour then threw it in the load I was washing. Most of the stain came out on the 1st wash. I pretreated it again and let it sit until I did another load a few days later and the stain was removed completely. I believe that if I had pretreated this stain right away like I normally do it would have come out in the 1st wash. Always check the back of your top when baby sitting because you never know what was dribbled on it. My friend said that she has gotten out all kinds of stains with Whink including formula, food, blood, and of course coffee. The best part is that it can be left on for several days prior to washing. I use a lot of it and it is very effective in removing just about any food or drink stain that shows up in the family wash. It also works well on grass and blood stains. I first became aware of the product when a friend informed me that it worked well on formula and baby food stains. For this product I purchase the largest size available.